Seven college students -- six from the University of South Carolina and one thought to be from Clemson University, died in an early Sunday morning house fire at Ocean Isle Beach, N.C., authorities said. Dean of Students Dennis Pruitt said the USC students were from Delta Delta Delta sorority and Sigma Alpha Epsilon fraternity, although it was not an official social or university outing. Identities of the dead were not available and it was not immediately clear how many of the students were male or female or what class year they were in. Pruitt said authorities were being cautious in releasing names because there were other college students in the area over the weekend. The bodies were being sent to the state medical examiner's office in Chapel Hill, N.C., for identification. Names may not be released for several days, authorities said. Thirteen students were reported to be in the house. Six were sent to hospitals for treatment and released. One survivor jumped from the burning home and into an adjacent waterway. 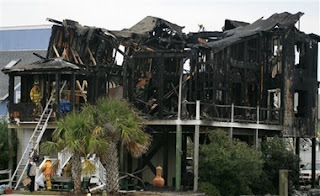 The private home was being used by the owner's daughter and a group of her friends, Ocean Isle Mayor Debbie Smith said. USC grief counselors, including a school chaplain, were consoling students Sunday afternoon at the Delta Delta Delta sorority house in the Greek Village. Sorority members said five of their "sisters" had taken a trip to Ocean Isle Beach this weekend, but they did not know any more details. The trip was not organized through the sorority, they said. "There were three kids sitting on the ground screaming," said newspaper deliverer Tim Burns, who called 911 after seeing a column of smoke rising from the house. "There was one guy hanging out the window and he jumped in the canal. I know he got out because he was yelling for a girl to follow him." Burns said he didn't know if that girl was able to escape.